3 How To Apply ? Kashmir Education Initiative (KEI) USA in collaboration with lqbal Memorial Trust (IMT), invites applications for scholarships from meritorious students presently studying in Class 9th. ** Total annual income of the candidate’s household should not exceed INR 3, 00,000. In case any information provided by the applicant is found to be false or misleading, his/her application will be immediately rejected without any notice. 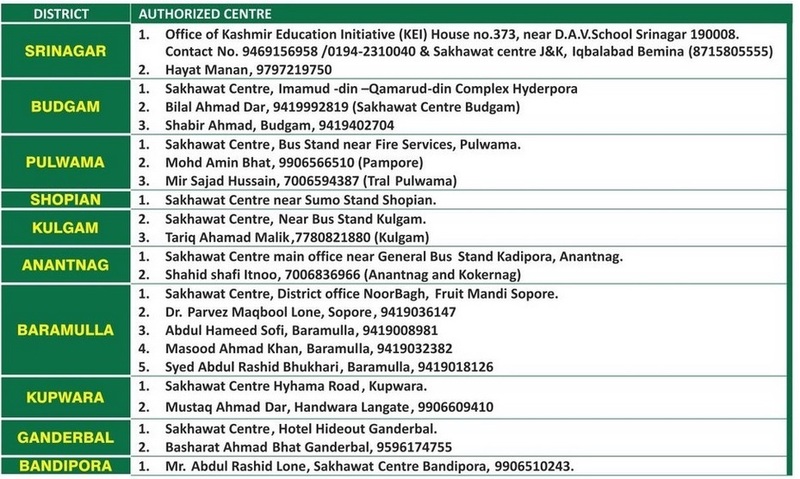 ** Applications can be collected from any of our authorized centers or schools (listed below) at free of cost. ** Application forms can also be downloaded from the Kashmir Education Initiative website kashmirei.org (or) You can directly download the application form from below. Candidates have to follow the given steps to fill the application form. Column-4 : Date of Birth – Date of Birth is to be written in the DD/MM/YYYY format. Column-18 : Sign- The student should sign in the space provided. Paste your latest passport size photo attested by School Authority in the space provided. Column-22 : Income & Financial Details – Mention the Father’s gross annual salary/income in Rupees and Mother’s gross annual salary/income in Rupees. Column-23 : Income From – Mention the Income from Agriculture, Orchard, Other sources and Total Gross household annual income from all sources (a,b,c,d,e) in Rupees. Column-25 : Sign- The Parent/ Guardian should sign in the space provided. Column-32 & 33 : Date & Contact Number – Date & Contact Number to be written in these Columns. ** Completed application form duly attested by the Principal or Head Master of the current school where student is enrolled in his/her 9th Class. ** Self Attested Copy of student’s Class 8th marks certificate. ** Proof of total household annual income duly signed by the tehsildar OR president of local masjid-committee/Auqaf, according to the format on the application form. ** Four recent Passport size photographs of the applicant. ** If any of the parents/guardians are salaried employees (who are in full or part time, government or private employment) a Last Pay Certificate (LPC) duly stamped & sealed by the Salary Disbursing Officer must be submitted, in addition to the above certificate. ** Incomplete applications without necessary attachments will be out rightly rejected.